We are partnered with one of Montreal's oldest piano workshops to recondition, restore or tune your piano. Lesser known than its famous contemporary Steinway, The Mason & Hamelin Piano continues to produce well crafted instruments coveted by artists and collectors alike. We can attest to thier heavy construction! The Mason on the left has received a new bridge, the soundboard reshimmed and crowned and of course a new decal before the plate and pinblock. Stripped down they do not weigh much more than a dresser. RECONDITIONING involves a general upgrading of the whole piano, but with as little actual replacement of parts as possible. For instance, the reconditioning of an old upright piano might include resurfacing the hammers (instead of replacing them) and twisting the bass strings to improve their tone (instead of replacing them), as well as cleaning the whole instrument and regulating the action. 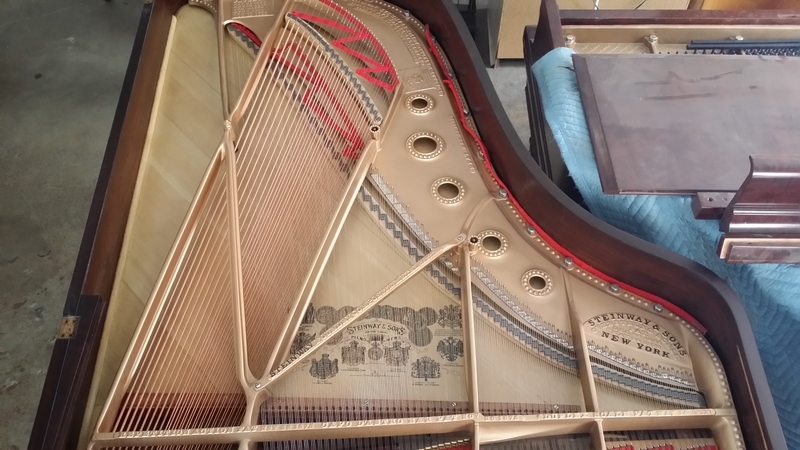 If parts are broken or missing, they will be repaired or replaced by a professional piano tuner. 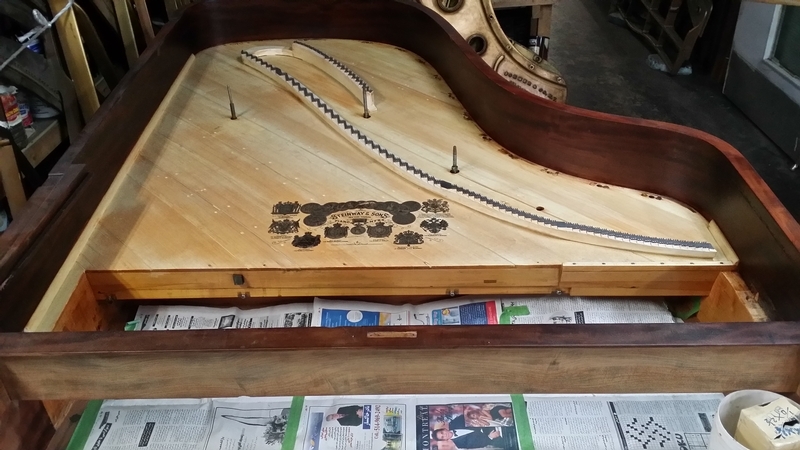 RESTORATION involves restringing the piano and replacing the pin block. In regards to the action, restoring would include replacing the hammer heads, damper felts, and key bushings, and possibly replacing or completely overhauling other sets of parts as well. Refinishing the piano case may also be done as part of a rebuilding job. 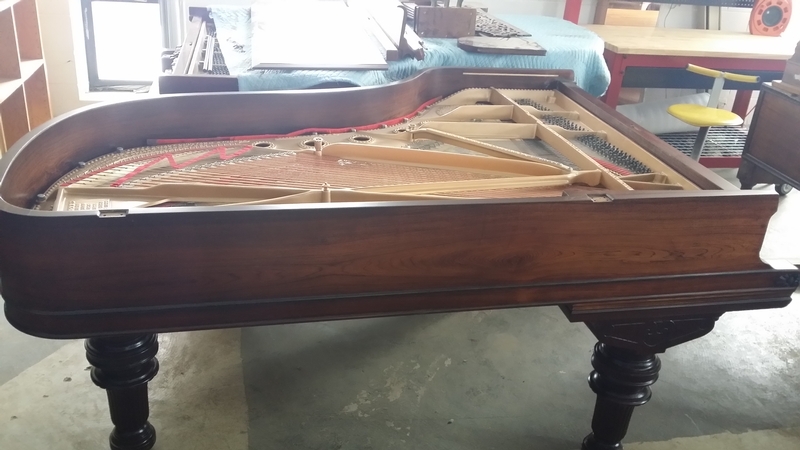 Ideally, restoring means putting the piano into “factory-new” condition. In practice, however, it may involve much less, depending on the needs and the value of the particular instrument. 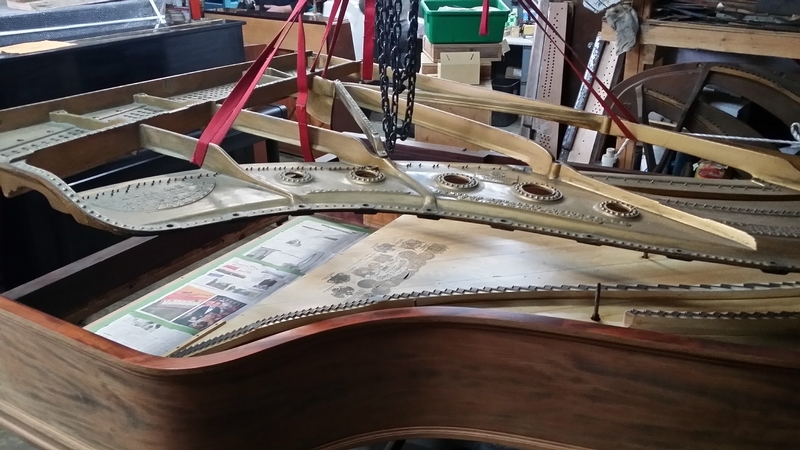 Below is a Steinway Grand in various stages of restoration. 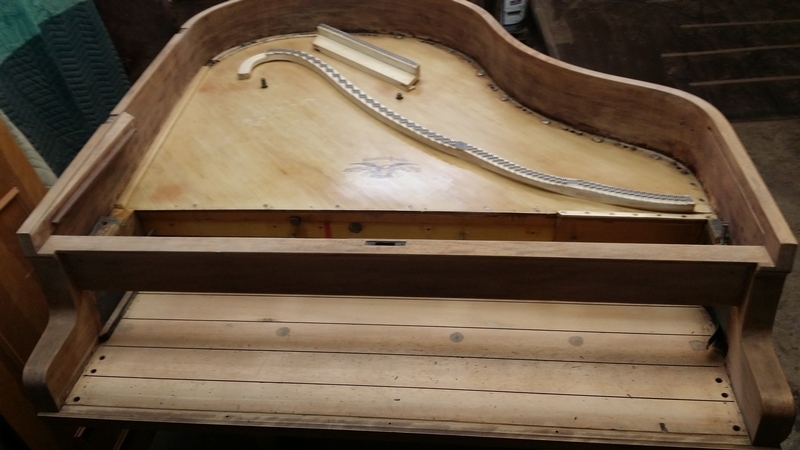 The pin block and cast iron plate is removed and the work is completed on soundboard and new bridge and pin block and of course new strings. Each step conforms to standards set by the manufacturer. Downbearing and regulation tolerances must be carefully observed. This labour intensive process is reserved for Grand Pianos and a limited number of uprights (Heintzman or Steinway for example). In the unfortunate circumstances of fire and water damage, we can pick up the piano for quick removal. 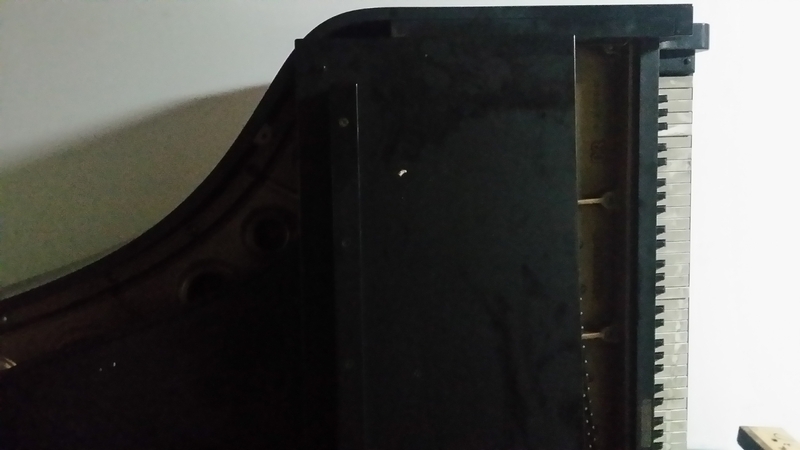 Your piano is evaluated by qualified technicians and we initiate a cleaning and sanitization of your piano. Unlike a regular piano restoration, fire and water damage can only be repaired using Ozone treatment. Our special Ozone Chamber has proven to be the most effective process to remove odours and excess humidity from the piano. 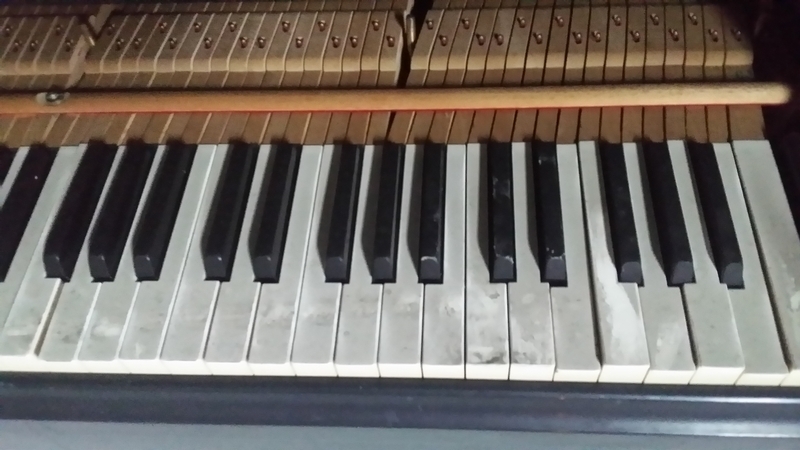 This Yamaha piano has been exposed to smoke, humidity and heat. Luckily it escaped the flames and will receive a thorough cleaning, Ozone treatment, and some long days on the mechanism. In cases like these, the piano will also need tuning and it will leave our shop in better shape than before the fire.